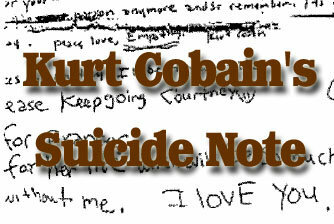 Curt Cobain - Suicide Note analyzed. - Nirvana, rock, Suicide. Free. Take the Handwriting Wizard 12 Minute Self-Test. What does Your Handwriting Reveal? Legend of Rock Ends Own Life. Lead Singer of Nirvana, Curt Cobain takes his own life after penning this last letter. Take a look at this suicide note. What strikes me deeper than the contect of the letter is the person pain at which he must have been suffering (needlessly.) People who write this tiny have 10x more intensity, focus, and concentration that the rest of us. Also, they tend to "harbor their emotions" inside - unable to express joy or happiness very effectively. It is so sad to see people with so much talent and potential to make a positive impact on the world suffer from a lack of understanding of how to control and influence their own emotional states. Go here to See the Handwritten Note. Go here to see the translation (typed) words contained inside the handwritten note. Go here to see my notes relating to the handwriting traits. Subscribe now to weekly newsletter, now, free 6 month trial offer.